· Your subscribers from the web interface (“online payments” since payment is initiated by the customer via web interface). · The PortaBilling® system itself. These payments are called “auto payments” because they occur automatically. To begin accepting credit card payments you must have a merchant account and an account with an online payment processor. A merchant account must be opened at a bank. It is similar to normal checking account. It stores funds received from credit card payments. A merchant account is usually enough to start processing credit card payments via charge slips. However, if you wish to initiate transactions from your own server via the Internet, this service is provided by online payment processors such as Authorize.Net. You establish an account with an online payment processor, provide it with your merchant account information, and receive credentials (username, password, etc.) for using payment processor’s API. So now your application can connect to the processor’s API server and initiate transactions. For more information about e-commerce payments support please refer to the Payments chapter of the PortaBilling Administrator Guide. 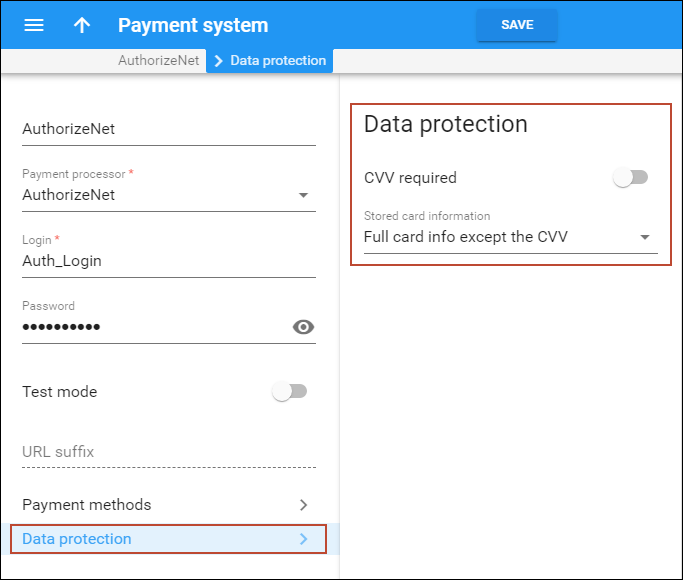 A CVV verification is a common safety measure for online payments, and in many cases a merchant acquirer, a payment processor or / and an ITSP as a merchant will request a CVV to be included with transactions. The only drawback of the mandatory card security code verification is that the end user or admin must enter a CVV each time they make online payments and, consequently, auto payments cannot be configured either. The ITSP wants to receive online Visa and MasterCard payments from its customers in USD. The minimum payment is $5. The ITSP already has a merchant account and a contract with the payment processor Authorize.Net. ITSP’s credentials for using Authorize.Net API are the following: username (login ID) – Auth_Login and password – auth_pass. In addition, its account with Authorize.Net is configured to not check card security codes. This will allow the ITSP to configure auto payments. After the payment system is configured, ITSP makes a payment of $25 on behalf of its customer “Smart Calls, Ltd.” using the credit card the customer supplies. This card information is saved for future payments. 1. On the navigation menu, select Financial, then select E-payments and open the Payment systems panel. · Name – Type in “AuthorizeNet”. · Payment processor – Select AuthorizeNet. · Test mode – Disable this option. 4. On Payment system panel, click on the Payment methods link. 5. On Payment methods page select Visa and MasterCard check boxes. · Store card information – Select Full card info except the CVV. 1. On the navigation menu to the left select Financial and then Currency management. 2. On the Currencies panel, select USD. 3. Click the Edit icon. 4. Click the icon next to the Payment and remittance systems. · Type of system – Select Payment system. 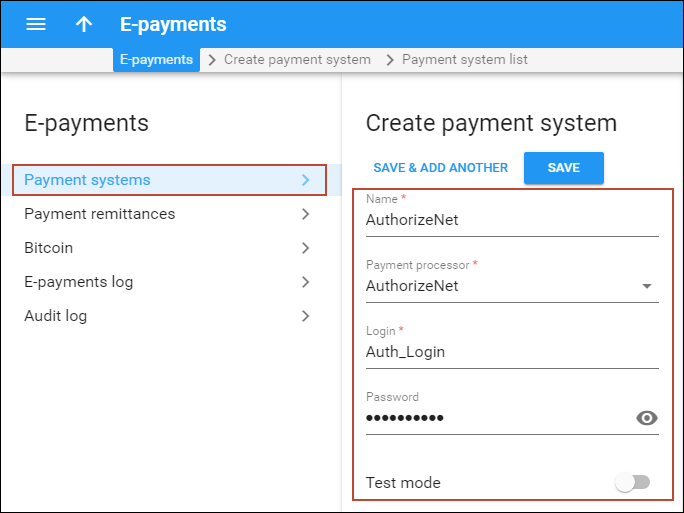 · Payment system – Select AuthorizeNet. 1. On the navigation menu to the left select Sales and then Customers. 2. Use the Customer search panel to search for the desired customer, e.g. SmartCalls. 3. Click the customer name to enter their record. 4. On the Customer panel, select Personal, General info and then Payment method. 5. On the Payment method panel, click the Add method button. 6. Select the Credit Card option and specify the required credit card details. 1. Use the Customer search panel to search for the desired customer, e.g. SmartCalls, Ltd.
2. Click the customer name to enter their record. 3. On the Customer panel, click the Balance adjustment icon. 4. In the Balance adjustment wizard, select E-commerce payment from the Operation type list and click Continue. 5. On the Payment method step, verify the payment method and click Continue. 7. On the Summary step, review the payment details. 8. Click Finish if the information is correct orBack to make changes. 9. After the successful payment processing, you will receive the payment confirmation. 10. Select either to print the receipt or simply close it by clicking the corresponding button. The preferred payment method can also be configured while making a payment. 2. Use the Customer search panel to search for the desired customer, e.g. Smart Calls, Ltd.
4. 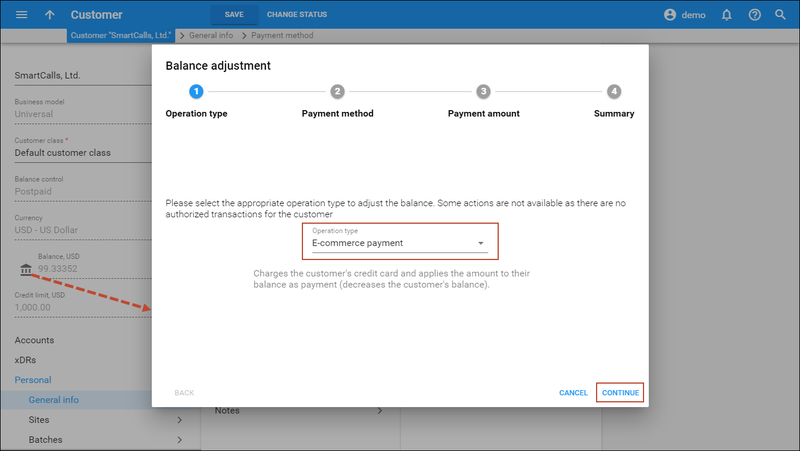 On the Customer panel, click the Balance adjustment icon. 5. In the Balance adjustment wizard, select E-commerce payment from the Operation type list and click Continue. 6. On the Payment method step, select Credit card from the Pay using list and specify all the required credit card details. 8. On the Payment amount step, type in “25” in the Amount field and click Continue. 9. On the Billing address step, specify the customer’s billing details. 10. Move the slider to save the credit card information and click Continue. 11. Review the payment details on the Summary page and click Finish. 12. After the successful payment processing, you will receive the payment confirmation. 1. On the customer self-care interface, go to the Billing Information tab. 2. In the left-hand menu, click Make a Payment. 4. In the Payment Methods section, select Pay directly with any major Credit Card including VISA, MasterCard, American Express. 6. Select the Credit or Debit Card option and specify the required credit card details. 7. Select the Save this information for future use check box. 8. Click the Pay Now button. 3. In the Amount, USD field, type “30”. 5. Click the Pay Now button. 6. After the successful payment processing, you will receive the payment confirmation. The scenario is the same as in Payments without card security code verification. The only difference is that an ITSP’s with Authorize.Net is configured to check card security codes. 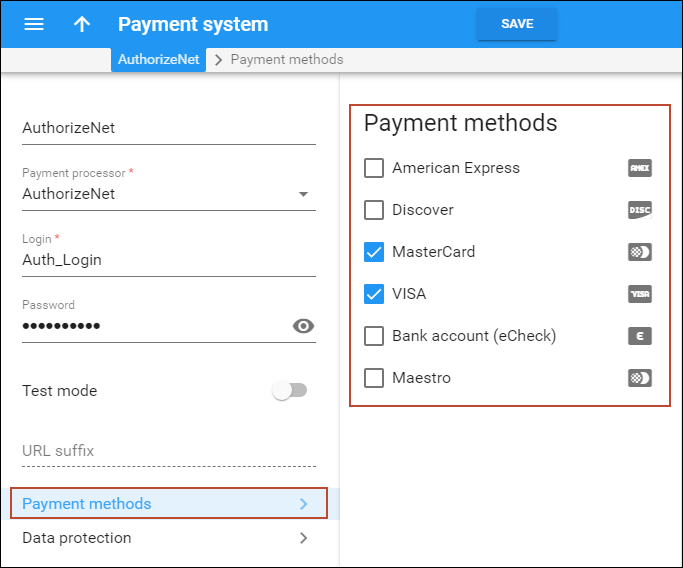 Configuring PortaBilling® in this case is almost the same as described in the Payments without card security code verification section, except for an additional option that must be selected in the Configure a payment system step. 2. On the navigation menu, select Financial, then select E-payments and open the Payment systems panel. · Test mode – Leave this option disabled. 5. 5. On Payment system panel, click on the Payment methods link. 6. 6. On Payment methods page select Visa and MasterCard check boxes. · CVV required – Enable this option. In the case of token-based payments, a payment processor stores the credit card data (or other payment information) and issues a token instead. A token does not contain actual credit card data but serves as an identifier of the card for the payment processor. PortaSwitch® stores this token, and sends it to the payment processor when an end user pays for a service online. Based on the token, the payment processor retrieves the required payment data and then completes the transaction. Storing tokens, as opposed to storing credit card data, doesn’t require you to obtain a PCI DSS or similar security certification, so you can launch the service almost immediately. For token-based payments, credit card information (including CVV) must be included only with the initial transaction on each new credit card. Once the transaction is successful, the payment processor issues a token for this card. Subsequent transactions are made using the token, and additional card security code verification is not required. Thus, when token-based payments have been configured, you can offer your customers using such feature as auto payments. For the list of payment processors that PortaBilling® supports token-based payments for, please refer to the Payments section of the PortaBilling Help. The scenario is the same as in Payments without card security code verification. The only difference is that ITSP now recognizes that token-based payments for Authorize.Net are supported by PortaBilling® and therefore uses this functionality. PortaBilling® configuration in this case is almost the same as described in the Payments without card security code verification section, except for one option selected in the Configure a payment system step. 5. On Payment system panel, click on the Payment methods link. 6. On Payment methods page select Visa and MasterCard check boxes. · CVV required – Leave this option disabled. · Store card information – Select Token only. These additional features can be enabled after you have performed the basic PortaBilling® configuration that enables making payments with credit cards. Auto payments (also called recurring payments) are automatically charged to end users’ credit cards and applied to their balances. This helps to improve the payment process for both the end user and the service provider as it is convenient and requires minimum effort on either part. NOTE: This feature becomes available when you configure PortaBilling® to accept credit card payments without credit card verification (Payments without card security code verification) or use token-based payments (Token-based Payments) (i.e. the configuration doesn’t presume that a card security code must be presented with every payment). In our example, Smart Calls, Ltd. wants automatically pay all received invoices and top-up the balance for $100 when it approaches the credit limit. 4. On the Customer panel, select Personal, click General info and then Payment method. 5. On the Payment method panel, select Yes from the Charge the invoice amount using this payment method list. 6. Enable the Use automatic payments option. 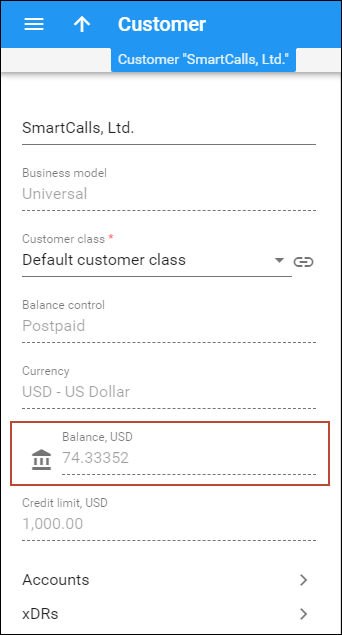 · Type “200” in the Apply payments when the balance exceeds, USD field. Note that for prepaid customers (which balance decreases as they consume services) the when balance exceeds option means that the balance actually becomes lower than the indicated threshold. 2. In the left-hand menu, click Payment Info. 3. In the Auto-Payments area, select the Auto-pay invoice using this payment method check box. 4. Select check box next to Pay… when balance exceeds … USD. 5. Type “100” next to Pay and “200” next to when balance exceeds. Note that for prepaid customers (which balance decreases as they consume the services) the when balance exceeds option means that the balance actually becomes lower than the indicated threshold.